IMG_1623, originally uploaded by jahansell. ...or tiny little red peppers? Whatever they are, they're gone now - the last time I drove past this spot the tree was bare! I saw the title and thought, "oh, no - already?" then was so pleased to see it was nature's holiday lights! Great photo. 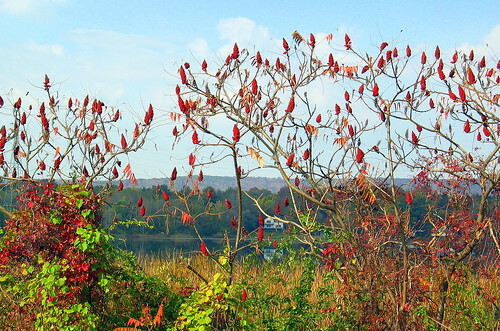 Sumacs! The birds probably got the fruit. Hi Jenny, I dig this photo b/c it's so fun. You, they could pass for exotic birds perched there!